Playlist is a new (largely self-explanatory) feature, curated by members of Team FG. Simon has the pleasure of cutting the ribbon for our first Playlist - tracking his favourite albums of the year so far. 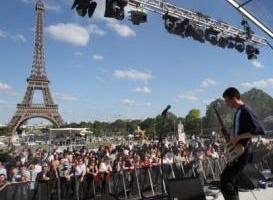 We’re half way through 2011 and with the Fete de la Musique here in Paris marking the equinox, it’s a great day to be out on the streets. If you’ve never tried it, by the way, it’s a cheap visit as you don’t need a hotel ‘cos it goes on all night – it got me thinking about the albums I’ve really enjoyed so far this year, and (being somewhat obsessive about lists) what my playlist featuring the best of the best of 2011 so far in less than 30 minutes, would look like. So here’s my track listing not in order of merit, but rather recommended listening experience. The respective album reviews are linked to in the brackets next to each track. Listen to the playlist in full in the YouTube embed near the bottom of the page. Really lovely song from a band at the top of their form, drawing on their experience to produce something deliciously simple. "This is a stick up/This was a stick up" – officially the best first/last line combination to any song. Outstanding track from attractively packaged, long delayed follow-up to 'Mirrored'. This is a funky song that shows just how high this band can fly with a vocalist in tow. I could have taken any song from this album – they’re all terrific. This one is a quirky, dark sing-along number from a bright, emerging star. This is my favourite track from their finest album in a long time. Even if the best line is borrowed. It reminds me of Neil Young, which is a huge compliment. Title track from debut album of yet another lo-fi two-piece band, but this one truly hits the spot. PS I Love You hail from Canada and this is a tremendous album packed with mighty songs. Return to form in no uncertain fashion and perhaps their best ever album (stream in full here) – after all these years, who’d have predicted that? And of course the 'Fight For Your Right Revisited' mini film is an absolute treasure. More veteran action from a live set that shows exactly why the Melvins have been such an enduring force and influence. They’ve never sounded so convincing. Kicking song from the UK’s most consistently brilliant band of the last fifteen years. (No that wouldn’t be ~Radiohead). Can’t wait for the invite. So that’s the playlist, with just two honourable mentions to add. The Ghostpoet single 'Survive It' is pretty great I think, but I’m just now coming to grips with the album. And Antlered Man don’t have an album yet but 'Surrounded By White Men' is one of my standout 2011 tracks. Listen to the playlist all in one go by clicking the YouTube embed above.